Spacious designer home on quiet residential street, with sea views, walking distance to three beaches! This gorgeous, 3 level, completely renovated house is just a short walk to Gordons Bay, Tamarama and Bondi Beach and right by St Marks Park, where you can join the Bondi to Bronte walk or be adjacent to the Sculptures By the Sea! There are views down the coast from the front of the house, and a beautiful sunny courtyard to the rear of the property with glimpses of Bondi Beach, and offering a great area for alfresco dining! On the top level you'll find the Master bedroom with a queen bed, en suite and walk in robe and balcony, a second bedroom with a queen size bed and balcony, a third bedroom with two single beds, and a full bathroom. Located on the ground floor is the large retreat/office. The house is air conditioned throughout, yet opens up perfectly to take advantage of the summer sea breezes. Access is either through the secure front gate, shared with the neighbour or through the double garage that has a secure door that takes you past the office. The house has alarmed security systems, including video intercom, high tech lighting and adjustable heating for each space from a central computer console. All easy to use. Internet Access - WIFI is included. Laundry: Internal laundry with washing machine and dryer. Robert, January 2016 - They experience was seamless and the house was wonderful. It was a great space to celebrate the summer with large, beautiful views of the sea. Deborah was a pleasure to work with and easy to communicate with! Tamar, December 2016 - Great vacation spot- location is spectacular (across the road from the water and the beautiful cliff walk). A short walk to Tamarama and Bondi. Deborah was very responsive and attentive and made sure we were perfectly settled. Overall a great rental- clean and spacious, and a great spot if visiting Sydney. Danielle, November 2015 - The house was perfect. We were so impressed with the accommodation, the view and facilities. We couldn't have asked for a better place to stay and get ready in for my wedding. Thank you! Susi, November 2015 - Deborah met us on arrival and showed us around the property. She was really knowledgeable and was a very friendly face to be greeted by. The living areas are very spacious and great for entertaining. The outdoor area is superb - the photos do not do it justice! This is a great place to relax and unwind as a family. The garage was a real plus as parking in the area was very difficult. We really enjoyed our stay. There is the delicious "M cafe" very close by which is open 7 days a week and offers food for breakfast & lunch.There is a local general store and post office across the road also for any supplies required during your stay. 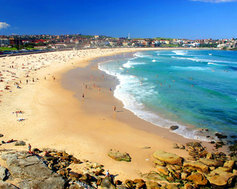 It is a 4 minute walk to local takeaways,restaurants,wine bars and local hotel .The famous Bondi Icebergs Club is a 5 minute walk to where you can sip a beer whilst over looking the surf and waves of Bondi Beach or dine in the bistro bar or upstairs in the 5 star dining Icebergs restaurant. The 380 bus stop is across the road for a 7 minute bus ride to Bondi Junction train station.The buses run every 20 minutes or so until midnight.The train ride to the City is 10 minutes with the trains running every 30 minutes or so until midnight.